Outbreaks of measles have been confirmed in five areas of England and now total more than 120 cases. Public Health England says the cases in West Yorkshire, Cheshire and Liverpool, West Midlands, Surrey and Greater Manchester are linked to ongoing large outbreaks in Europe. The overall risk in the UK is still low, but outbreaks can happen any time. The MMR jab protects against measles. Experts are urging parents to immunise their children. Anyone unsure if they are fully vaccinated should check with their GP. PHE says cases in England appear to be stabilising. As of 9 January, there have been 34 confirmed cases in West Yorkshire, 29 confirmed cases in Cheshire and Liverpool, 32 confirmed cases in the West Midlands, 20 confirmed cases in Surrey and 7 confirmed cases in Greater Manchester. Unvaccinated people travelling to Romania and Italy, where there are currently large outbreaks of measles, are at particularly high risk, says PHE. The MMR vaccine is available to all adults and children who are not up to date with their two doses. Children up to the age of 18 and adults without immunity should have a catch-up MMR vaccination. Experts say most adults born before 1970 are likely to be immune because they have probably been exposed to measles already. Dr Mary Ramsay, Head of Immunisation at PHE, said: "This serves as an important reminder for parents to take up the offer of MMR vaccination for their children at one year of age and as a pre-school booster at three years and four months of age. Children and young adults who missed out on their MMR vaccine in the past or are unsure if they had two doses should contact their GP practice to catch-up. "We'd also encourage people to ensure they are up to date with their MMR vaccine before travelling to countries with ongoing measles outbreaks." 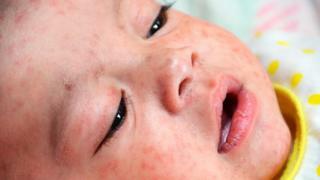 Measles is a very infectious, serious illness that, in rare cases, can be fatal. Symptoms include a runny nose, sneezing and cough, sore, red eyes, a high temperature and, after a few days, a red-brown blotchy rash.